Wail, you inhabitants of the market district! All those who handle money are cut off. in the Temple of Yahweh of Hosts in that Day! Today is probably my last day house-sitting, so I'll use the time to write here. I had a nice thanksgiving dinner at my friends', Damian & Dorina. She made an incredibly delicious vegetarian nut loaf. After dinner, we discussed different philosophies and such. Then a friend brought to my attention, and not at all in a nice way, that I tend to interrupt and dominate the conversation. I have always thought of myself as a listener who doesn't talk much. And I like to think of myself as "aware." But I had to concede that he was right, though. Sometimes I get excited about stuff I'm learning and tend to forget about others. Just when I think I'm getting it together, I find I'm not. Knowledge isn't enlightenment. In fact, as I keep saying, it veils us from enlightenment. Anyway, I've been licking my ego wounds a lot since. And just that fact of still feeling wounded shows a great attachment to this ego that I thought I had pretty much overcome. That's also a problem with blogging like this. You can only see words, not my person. And it's easy to present ourselves as flawless to the world when we write. I started writing a reply to a comment by "Angeldust" after "My Summary of Why I Live Moneyless". Then I decided to just go ahead and make it a blog entry. It's time to see the Bible in a whole new light. 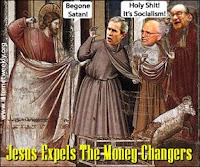 It's time to shake up tired, sleeping JudeoChristian religion out of its materialistic stupor. This might just blow you away. 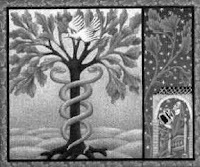 Serpent Coiled Around the Tree, Serpent Coiled Around Pole In Genesis 3:13 Eve says, "The serpent [nahash*] deceived [nasha*] me." The Hebrew Bible is filled with plays on words totally missed in translation. The word nasha* means both 'deceive' and 'lend on interest,' or 'be creditor'. (In Strong's Lexicon, 'deceive' is Srong's # 5377 & 'lend on interest' is 5378, which are identical)*. This nasha is found in 1Sam 22:2, Neh 5:7, Psa 89:22, Isa 24:2, all of which, like the Koran, strongly denounce lending at interest). Now look at the Hebrew word for snakebite, nashak [Strong's 5391]* , which also happens to mean both 'lend' and 'receive on interest' (Num 21:6-9, Deut. 23:19, Prov. 23:32, Jer. 8:17, Amos 5:19, etc). 'The serpent bit me,' Eve says. 'The serpent charged me interest,' Eve says. 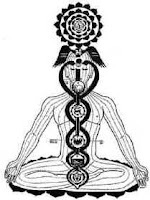 Now the word for serpent, nahash is also a wordplay with nasha. Nahash also means 'divination,' and also 'copper' or 'bronze,' the basic currency [Strong's 5174 & 5], just like our English word 'cobra' is related to 'copper'. You can see this play on words taken into the story of Moses lifting up the Bronze Serpent in the wilderness. If a serpent had bitten anyone can literally be translated, if a serpent had become creditor to anyone...! 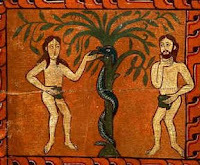 Now we can see why there is a Jewish interpretation that Cain is actually the son of the Serpent! He is the son of purchase, of credit & debt, while Abel is the son of Grace. Next, in the story of Cain, you see allusion to the 7-headed Leviathan (Hydra, Beast) with the 7-fold vengeance of Cain in Genesis 4:15 & 24. Now it is clear that this credit-and-debt 7-head Serpent is poking his heads up in Deuteronomy 28! He is Leviathan. "'Now this time my husband will be bound [lavah] to me,...' therefore he was named Levi." (Gen. 29:34). Levi was the father of the tribe of Levi, the Priestly Clan, the establishers of Levitical Law, starting with the Levites called Moses, Aaron, and Miriam. Law is Thought of Credit and Debt. Law is control of Credit and Debt. The Levitical Law, as all law, was given to manage people under Thought of Credit and Debt, a way of keeping disease in check until the cure comes - the cure of Grace. Just as Krishna speaks of transcending the cycles of Credit and Debt, transcending the perpetual reincarnation of Karma, the old Hindu Law, through crucifixion of the ego, so speaks the Buddha, so speaks the Christ. 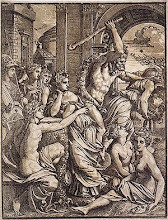 the close-coiling one with seven heads." Leviathan is the Serpent of Canaan. Canaan means trade, or commerce in Hebrew. Here again we see the play on the words for 'Cain' & 'purchase'. The land of Canaan, called Palestine and Israel today, was wedged between two great superpowers, Babylon and Egypt, and two great continents. This made it the land of Trade - the land of war, oppression, and deceit - the products of Trade. And it was out of this that the rage of the Bible is born. And Jesus' clearing the merchants from the temple is a direct act-out of this Zechariah scripture. Wiping out the Canaanites. Yes, the mystery is that the Levitical law is to become fulfilled, to become obsolete at the End of Time, which is the Eternal Now, the Day of Yahweh. Money/trade serves its purpose and becomes obsolete. All written law becomes fulfilled, obsolete. Money and law simply cannot exist in the Present, in Reality! This is not opinion. This is simple observation, if we but look inside. It's interesting that, in the Christian Bible, the Greek word for money is nomisma and the word for law is nomos, sharing the same root meaning "to parcel out." There is no need for law when there is no money or barter, and there is no need for money when there is no law - for both are one and the same - control of credit and debt. When you start trusting Nature again "to parcel out", that vengeance, repayment, belongs to God, not human ego-mind, then Balance comes, as it already exists in the infinite Universe surrounding our little bubble of "civilization". And this is the very theme of Christian theology: freedom from written law and taking on the law of the heart, which is love. Crucifying the Ego, which is Thought of Credit and Debt. It is about giving up the ego to the cross, lifting up Moses' serpent on a pole in the wilderness, the Lamb breaking through the Seven Seals. *If you want to confirm these word studies, you can go to www.blueletterbible.org to look up the Hebrew, Greek, and Aramaic words of scripture passages, or www.scripture4all.org/OnlineInterlinear/Hebrew_Index.htm for Hebrew-English interlinear Tanach (Old Testament), and www.scripture4all.org/OnlineInterlinear/Greek_Index.htm for Greek-English interlinear New Testament. The Blue Letter Bible uses Strong's Lexicon, so I've put in Strong's numbers to make it easier for you to look up. I like the Spanish name for this holiday, because it shows this is a celebration of Grace, of Gratis. You can't feel Gratitude for something that you "earned". Gratitude is the sense of unmerited favor, of Gift, and every particle of the Universe, outside our money-mind system, runs on, by, and through Gratitude. Look into any wild creature's eyes and see its burning fire for yourself. I'm all excited. Somebody left me a comment with this link: www.utterpants.co.uk/notpants/madmoney.html, which I just added to the link bar to the right. It's a blog entry I've been wanting to write, and now I don't have to do it because this Michael Dickinson already did, and I couldn't have written it better! You gotta read it, and you'll see these ideas on money aren't my own hair-brain ideas or opinions, but a universal truth that another witness is tapping into. Now I want to write from a "materialistic" viewpoint, this time not for folks who follow the religion of Evangelical Christianity, but for folks who follow the religion of science and materialism. So you believe that we all came about by chance, that the universe is a hodge-podge of random reactions. So you believe that Natural Selection brought us from an amoeboid to a rodentoid to an ape-oid to a homo sapiens. This is a fine and true religion. It is the result of simple observation, just as the ancient faiths are. And I maintain that if everybody in the world but believed (practiced) their own religion of simple observation, our world would fall back into balance with the rest of Nature, and we individuals would fall back into balance with our own natures. But let me point out that you most likely do not believe your own religion of science, just as most self-proclaimed Buddhists, Orthodox Christians, Mormons, Muslims, Hindus, Taoists, Sikhs, etc. do not believe their own religion. Simply put, faith is abandoning yourself to chance. Chance is the random interactions of credit & debt, positive & negative, outside human mind control. If you believe Chance brought us from a dust particle to a human, brought us thus far, why do you now not trust Chance to carry us further??? Why can't we trust that balance will occur if we but give up consciousness of credit & debt, if we but give up control of balance of positive & negative? When has a negative charge ever NOT been naturally met by an equal and opposite positive charge? When has a death ever NOT been naturally met by an equal and opposite life? Why do we continue to not trust that a "bad" deed is naturally met by an equal and opposite "punishment"? Why can't we, who call ourselves scientists, trust our own science, like an infant, that "Vengeance belongs to Chance, Chance will repay", not to our minds that can't even balance a budget. Why can't we trust that Nature is perfectly Just. When have wave crests ever NOT been met by equal and opposite wave troughs? If Female were not met miraculously by an equal and opposite Male, then life would cease. A positive coincides with a negative. If Coincidence ceased, the Universe would cease. Why do we think Coincidence, called Miracle by the religious, is an exception, rather than The Rule? Now I'm going to say some seemingly hard things. But you know they are true. Money and possessions side-step chance, putting a block on Evolution, skirting around Natural Selection. We think we are avoiding Death by accumulating money and possessions, by stockpiling positives and squelching negatives. But all we are doing is building up our own demise. The negatives will come back on us in a tidal wave, to bring themselves back into Justice with the positives we've horded. Isn't this what the Koran keeps saying? Isn't this a theme of the Bible and the Dao De Jing? Isn't this basic science? Why are we as a species nursing prolonged suffering from year to year, generation to generation, in the name of compassion, while Nature abhors prolonged suffering, knocking it off in Just Natural Selection before it can even establish itself? Mutations are naturally balanced with Order in the Wild World. But they are heaped up in massive imbalance in our Domestic World. And we pass them down, in ever larger masses, from generation to generation. Then people like Adolph Hitler arise and think they can re-establish the Balance, and they make it way worse. The erroneously call it Social Darwinism - but Darwinism it is NOT. Darwinism is Natural Selection, not Human Mind-Control Selection. Darwinism is Faith in the Law of Nature, not faith in the laws of human mind-control. I like how the Inuits (Eskimos) of the past (and maybe still the present) lived in such balance with Nature, that when one became old and too lame to be happy, to contribute to the tribe, she would voluntarily go sit on an ice float cross-legged like the Buddha and wait for a polar bear to eat her up. Missionaries thought this barbaric and put an official end to the practice. Now the Inuits are so happy with their booze and chronic illness and their oil money. When you read accounts of anthropologists who studied the Inuits before Missionary money "saved" them, they are totally astounded how these tribes living in one of the harshest environments on earth could be so constantly happy. The Kung (Bushmen) of the Kalahari, like the Inuits, lived in another of the harshest environments on earth. The Kalahari doesn't even have regular surface water, and the Kung only carried bows & arrows. The rumor among the civilized was that these Bushmen were poor souls continually suffering, slaving, scratching out a living from the harsh desert. Then anthropologists went in to study them, and were astounded. The Kung were, in fact, the most studied of all hunting-and-gathering tribes. And anthropologists found that they only worked 2 to 3 hours a day, and the rest of the time they spent in leisure. But even that is bogus, because I can testify that when you live without money, there is no distinction between work and play. Watch any wild animal and you'll know what I mean. Don't watch money-funded propaganda nature flicks on TV if you want an accurate view. Go out and see for yourself. Slaves of Civilization are struggling and suffering, not for food, but to maintain possessions and fictional bank accounts and appearances. And such slaves can't imagine that life could be any other way, so they believe nature is cruel to justify their own cruelty against both themselves and others. Yet, I Am Not a Primitivist! I am not really a primitivist. Human inventions come from the same Creative Source as leaves and flowers and chimpanzees and electrons come. Do you know who invented the automobile, the television, the microchip, the rocket, the piano, the paintbrush, the wheel? Chances are you don't. But you know who got famous marketing each of those things and pushing them like drugs for profit, don't you? I had this realization once when I worked at a homeless shelter in Boulder, Colorado. One of the residents was an inventor of machine parts. Presently, he was working on a better sewing machine bobbin. He was doing it for the pure joy of creating - and you know he wasn't doing it for money or fame. The greatest works of art are in temples, done by the obscure for the obscure, simply for the pure joy of doing. Work and play and creation and reward and joy are all One in the Present Moment. Last summer I talked with a Nepalese Buddhist in Portland, Oregon about these ideas on living moneyless. He got all excited and immediately started envisioning people building cars purely because they wanted to, making computers from a place of pure joy, building cities from instinctual creativity - all within a purely gift economy. Nobody owns anything and all things are shared. And everything balances out as in Nature, because our true selves are Nature. He had the look of a child as he envisioned this "naive" world. Naivete is our only salvation. All great things begin with the "impossible" vision. With faith all things are possible. Another beautiful fall day around Moab. In a previous blog entry, I wrote of my friends, Gordon & Kay, coming to visit at the end of last May. What I didn't mention is that Gordon came to make a short docu-film on living moneyless. He finished the film, & has an webpage intro & teaser for it, which I finally was able to get into. It's at www.moneylessinmoab.com. The music it starts with is some jamming I did on the "Freenotes", which are pentatonic-scale xylophones installed in a park in Moab that anybody can bang on - thanks to Moab's very own Richard Cook, who installed them years ago. Of course, free music on free instruments on public land is right down my alley. It's been a quiet & exhilerating last few days in the canyon. You know, when you become still, and all thoughts & words leave your mind, this is when you find that the same Indescribable Calm that is within you is the same Indescribable Calm that upholds all of Nature. Your mind cannot see reality until all words, all thoughts cease, and your mind becomes like a child's - a blank slate. You don't see things through the filter of judgement, of words, but just as it is. You see that words do not reveal Reality, but veil it. With words you believe in God. But without them you know God. "Be still and know that I am God," the Psalms say. And you see that this Indescribable Calm is the Source, like a Seed, from which all forms of Nature sprout, and to which all forms return again. And these forms of Nature are no different than the thoughts & imaginations that arise spontaneously in your mind. It's an exhilerating realization. Yet words & imagination can never, ever grasp it. You can never, ever grasp God, Reality, with thoughts, with words, with imagination. Now, looking within to this Law written on your heart, this is where you see that the very Heart of Christianity is the very Heart of Buddhism is the very Heart of Hinduism is the very Heart of Islam. Because this Calm is beyond time & beyond possession, it cannot be contained in human memory. All we have are words, messengers, that tell us about it, but the words, messengers are not it. Yet, how can I tell you about this No-thought if there isn't one point of contact between No-thought and thoughts, between No-word and words? There must be one Single Word that mediates between words and no-words, between Heaven & Earth, God & Human, Reality & Illusion, no? It's like the very infinitesimally sharp tip of a pyramid that goes from stone to no-stone, into the sky. It is the very Chief Capstone. It is the One Word that mediates between Reality and Thought (Illusion), that is both Reality and Thought - both Reality and Illusion. In the beginning was the Word, and the Word was with Reality, and the Word was Reality. . . . And the Word became illusion and dwelt among us illusions. When you discover the Infinite Calm of No-Thought, something drives you back to the world of thoughts. It is a desire to take the message to others. Perfect No Thought becomes imperfect thought, that it may gather up all of us who are lost in thoughts and bring us back to No-Thought. Our minds are lost in thoughts, and all we like sheep are gone astray from the Eternal Present (YHWH). So the Eternal Present (YHWH) becomes illusion in search of us, to draw us back. Buddhist masters know exactly what I am talking about. The Buddha, from the sense of Eternal Compassion, relinquishes Nirvana to go back as the Bodhisattva to gather up all of us souls lost in thought. This is the One Word, One Mediator, between Eternity and Time (Kosmos, illusion). If you look within, you will know what I am saying. "Do you not know yourselves, that Jesus Christ is in you?" Professed Christians look in the past and in the future and up in heaven for Christ & the Kingdom of God and the End of Time, but never within, never Here & Now. Having been raised Evangelical Christian, I know that most Evangelicals are obsessed with Jesus in the past and Jesus in the future; and they are obsessed with proving past creation of the world and future end of the world. They love everything but the Present. "Now when He was asked by the Pharisees when the kingdom of God would come, He answered them and said, "The kingdom of God does not come with observation; nor will they say, 'See here!' or 'See there!' For indeed, the kingdom of God is within you." Now we come back to the subject of Money. Money represents things past, things future, but never the Present. Images represent things past, things future, but never the Present. Words represent things past, things future, but never the Present. These words you are reading right now are illusions, unless you can't read. Covetousness (Greed) and Idolatry are one and the same, according to the Bible (Colossians 3:5, Ephesians 5:5). Idolatry is clinging to illusion, image. Idolatry is the mind lost from the Present, and is the root of all evil. And their words to the end of the world." Whoa! I thought, all my life I've been taught that this "Word of God" is the Bible, when the Bible itself says that this "Word of God" is not a book, but is the Utterance of Nature, beyond speech, language, and voice, and this Word is spoken to all the world! The Gospel already has been preached to every creature? And Jesus said the end would come when this happened? Then I looked up the original Greek word for creature. It is ktisis, which means every created thing! How on earth can a human preach human words to every created thing, every rock, every clod of dirt, every robin, every atom??? And how is it that the Psalms keep speaking of the heavens & earth and everything in them hearing the word of God? And how is it that the Psalms speak of the heavens & earth & everything in them singing praises to God? Hello... somebody look up the word animism. According to the very Bible, this is the Gospel According to Nature, not a book. When I say New Testament, don't you think of a book written with ink on paper? But this is not what the Bible says the New Testament is. Look up all occurences of New Testament (New Covenant) in the Bible, and see what I mean. The first mention of the word New Testament is in "The Old Testament" book of Jeremiah (31:31-34). And this passage is quoted in the "New Testament" book of Hebrews (8:7-8). It says that this New Testament is not written with letters, but on the heart. It is the Law of the Heart. And this, Hebrews states, is the goal of Christ, to bring to obsolete the imperfect Old Testament, the letter written with human hands, and bring us the New Testament, the Law written on the heart. Now what is strange, is that the Bible talks about the Law already written on the hearts of the Gentiles (non-Jews, non-Christians). Now we see that the non-religious (Gentiles) already have the law written on their hearts! They already have the New Testament, the Now Testament, which is already preached to every creature and is the end goal of Judaism and Christianity! And in the very end sentence of the above passage, we see that this is happening in the Day of Judgement, the Now, the End of Time! "The way that can be described is not the Eternal Way. The word that can be spoken is not the Eternal Word." To say any written words, anywhere, any time, are inerrant and eternal is idolatry. The very core doctrines of Evangelical Christianity are idolatrous, as are the very core doctrines of fundamentalist Islam and Mormonism. And idolatry can produce no truth. Idolatry can only produce destruction. It causes war, environmental degradation, pollution, poverty, and self-righteous bigotry. See for yourselves. Am I wrong? "The letter kills, but the Spirit gives life." Now, if you want to know truth, not just believe truth, you need to turn this computer off and put away these and all words of illusion and find the Stillness within, the Now, the Reality, "the Peace that passes all understanding." It's not enough to believe in God, "Be still and know that I am God." I'm back in the Moab, Utah area, living in the canyon. The last I wrote here, I was in Arcata, Cali, on my way from San Fran to toward Portland, OR. But then the wind blew me another direction. I had emailed my parents telling them my cousin said my uncle in the Bay area might not survive through the winter, and my parents decided to rush on out to see him. So I decided to hitch back to the Bay area for the mini fam reunion. On my way down, I took a detour to visit my friend, Dan, in Ft Bragg. I was so glad I did. We went through a lot of processing about our mutual friend, Ayla, who had killed herself a year & a half ago. Some of you who've gotten my mass e's from that time might remember that Ayla was one of the folks traveling in our "moneyless tribe" about 5 years ago. My parents, my Uncle Louis & Aunt Edith, my twin cousins Annie & Sue and their families, plus my 2nd cousin Lauren (who also happened to be passing through), all had a little family reunion. I was glad I decided to go. Life is short & precious. After much debate, I decided I didn't want to be in Portland for the rainy season, so I decided to go back to Colorado with my parents, and then back here to Moab. I have a piece of my heart in Portland, so it was hard deciding. So I headed back into the canyon for the first time since last June. The canyon here looks very different, from all the floods. And not only that, there was a fire where the cave is - so it looks nuked. But it felt kinda good seeing it cleansed like that. When I got just about to the cave, a coyote appeared about 50 yards from me! He was playfully poking into bushes, like dogs do, and he totally didn't notice me. I stood there quietly until he finally turned his head and noticed me. Startled, he trotted to the edge of the burned-out woods. Then he stopped and looked at me curiously for about half a minute, then walked out of site. Then I looked at the blackened trees, the washed-out dirt, the patterns of ripples & lines on the rocks, sand, and the water. In fact, I tried to pick out a random square inch anywhere, just to see if I could find a single portion of disorder! Go out & try it for yourself. Is there a single square inch outside civilization's boundaries anywhere that is not saturated with pristine order? Actually, every square inch has a baffling balance between order and chaos - in everything, everywhere, constantly. It's perfectly imperfect! It's so perfectly imperfect, it eases the mind from the stress of civilization. We humans have the strange power to separate the order from the chaos in our minds, which takes effort. So we look around and either see one or the other - either order or chaos - but rarely the two in harmony. And in this separation of order & chaos our minds become either lethargic or stressed out. Then we blame it on chaos and try more & more to erase chaos, and make our world more & more clean & perfect. It's like we're living more & more on sugar, and cutting all else from our diet. But we can only hide chaos like a seed in the ground, where it grows unseen, waiting to come back in grand vengeance. Human representatives of chaos can't stand the sugar anymore and crave challenge, so they rise up in gangs and terrorism and random rebellion and screaming. Our bodies revolt and start strange self-attacking cancers, allergies, and self-defeating mental illnesses. Isn't this Nature's innate sense of vengeance, Nature's rebalancing act, bringing back balance between positive & negative? Chaos wants her rightful place of unity beside Order, and will get it, as long as galaxies roll. Human minds cannot balance the positive and the negative. Can any human mind truly balance a budget? Can any person balance the environment? Vengeance, pay-back, justice, balance, belongs to Nature, not us. We stole Fire, or Consciousness of Credit & Debt, from Heaven. We took the fruit of the Tree of Knowledge of Good & Evil. Isn't this the theme of myths in every corner the world? Back to that playful coyote again. The closer I live with nature, the more I see Nature playful. It's not the dreary, incessant scrounging for survival that most TV nature shows portray it to be. Chaos plays with order, perpetually, forever and ever. Why do bunnies & squirrels & deer run in front of cars, and why do climbers scale mountains and skydivers dive? Is it stupidity or the play of Risk? Playfulness is imbibed into every particle. Nature is harsh, yet it is gentle and quiet most of the time - and full of grace. Nature doesn't tolerate prolonged suffering, so it knocks out the lame. Thus we call Nature cruel. But it has such a perfect balance of life and death, pleasure & pain, that it keeps all of life interesting & stimulated with challenge, with no room for the mental illnesses & boredom that we suffer within the walls of civilization. Maybe we ought to redefine cruel. In the end, every single one of us life-forms will be smashed, selected away by Nature, as much as civilization tries to fool you that we won't. But if we come to realize there is no separation between chaos & order, won't we know there is no separation between pleasure & pain, life & death? Won't we have discovered what IS? This can all be translated into religious language, describing the very walk of Faith.